Hello! I am Lisa, self confessed foodie, mum of 2 boys and wife of a business owner Chris. I am that person that shares recipes or pictures of what I am cooking. And I love to eat! In September 2016, when both of the boys were in school I had a lot more time on my hands. I found myself experimenting with new recipes, ingredients and generally cooking more. Most people love to eat great food, but with the confines of family life, it’s not always easy to keep your repertoire current. Exploring what’s in season or new in the supermarkets or seeking out new recipes isn’t always workable. Getting out to your favourite restaurant may not happen as often as it used to! Life is often too hectic to make food the focus. It’s not that people’s love of food has gone, it has slipped off the radar. So that’s where I step in. I spend my time shopping around and experimenting with new recipes. Creating delicious food which doesn’t take all day or require a long list of ingredients. I wondered, why not pass on this advice, shortcuts and recommendations. My mission then became to create a community of foodies to eat well without the fuss too! Food has always been important to me, especially having Italian grandparents. It was always about the food, and I am still the same today! The long and short of it is, my love of food has carried me through many aspects of my life. Turning vegetarian at 13 (I lasted for 7 years but eat meat now as well as vegetarian food). Cooking on a budget at University, travelling around India and America. Teaching cookery classes at Bordeaux Quay cookery school, weaning my boys…. right up to the present day. This is where my passion has lead me and I hope you will follow the path with me! 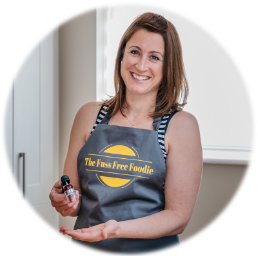 Remember to join our Fuss Free Foodie community on Facebook where we share what we are cooking or eating. Also, follow the Fuss Free Foodie on Instagram or Twitter to keep up with the journey!